Clean, dark and flat- that’s the landscape of the beach, if you want Sea Turtles to make it safely to nest and then back to sea. Both South Walton Turtle Watch and Friends of South Walton Sea Turtles offer a wealth of knowledge on sea turtle conservation. 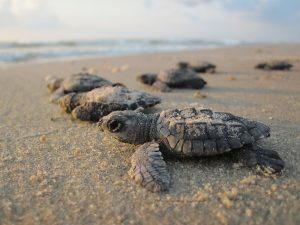 South Walton Turtle Watch focuses on locating and monitoring sea turtle nests and overseeing volunteers for the protection of the turtles and their hatchlings. They report that there are 119 nests this year which is a record for South Walton. Turtles are still nesting, but already it’s the best year in South Walton in 22 years. 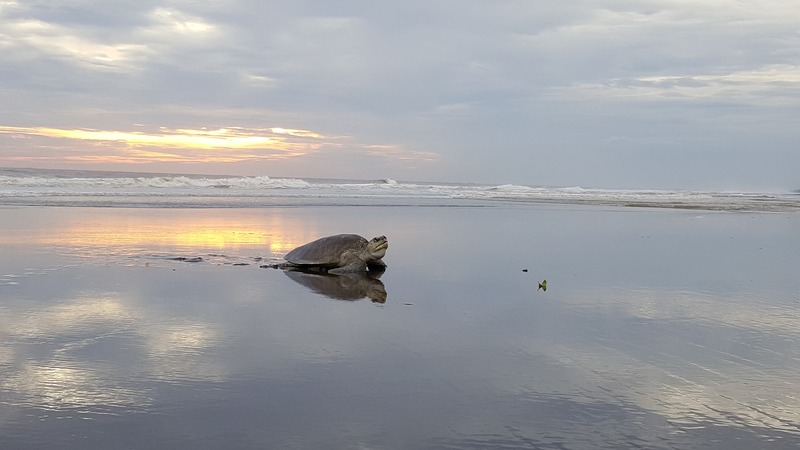 As of today, there have been 74 false crawls which occurs when a sea turtle comes up the beach to nest but something disturbs her and she does not nest. Many things can interrupt nesting; lights at a house or flash lights or people disturbing the turtle when she is trying to nest. The Sea Turtle Season is from May to October. They offer training in March to become a volunteer. Friends of South Walton Sea Turtles see their mission as one which is dedicated to promoting sea turtle conservation through awareness and education. They have placed education materials in the rentals, hotels, restaurants and schools and conduct education programs in the schools and community in South Walton. Their organization does not interact with nests, focusing solely on awareness through printed materials and online information, education programs, and local events. Their ambassadors have been out on the beaches educating tourists on how to keep the beaches clean, dark and flat for sea turtles and other marine mammals. Hands Off Hatchlings! 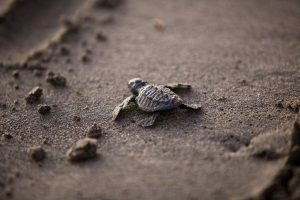 Sea turtle hatchlings are digging out of their nests and clambering toward the ocean in September and October, the last months of Florida’s sea turtle nesting season. To report a disoriented or lost hatchling or sea turtle in along Scenic Highway 30A or anywhere in South Walton, call 850-897-5228. Turn off or adjust lighting along the beach in order to prevent nesting females or hatchlings from getting confused and going toward lights on land, instead of the salt water where they belong. Use turtle-friendly lighting outside homes and other buildings along the beach. Replace incandescent, fluorescent and high-intensity bulbs with FWC-certified low-wattage, long wavelength options available in red or amber colors. Turn off outdoor lights at night when not needed. Shut Curtains and Blinds – Close curtains and draw blinds at night on beachfront windows and doors. The Blue Giraffe in WaterColor sells the red turtle friendly lights and both organizations have the flashlight covers appropriate for turtle season. Clear the Way at the End of the Day. Nesting mothers and hatchling sea turtles can get trapped, confused or impeded by gear left on the beach at night. Remove items such as boats, beach chairs, umbrellas, buckets and tents at the end of the day, and fill in holes or level piles of sand before nightfall. Also, avoid burying umbrella poles in the sand; use pole-holders or sleeves instead. Properly dispose of any trash, food or other litter in covered trash cans to avoid attracting predators to the nests. All holes must be filled in or they may end up as an impediment to turtles trying to get back to the sea. If a turtle encounters a hole and falls in, that turtle may not be able to right herself and make it to the sea. Choose Turtle-Friendly Activities. Remember less beach driving means more sea turtles surviving! While driving carts, cars or trucks are allowed on some beaches, vehicles can crush sea turtle nests, killing hatchlings and nesting turtles. Lighting bonfires on the beach is also hazardous to sea turtles. 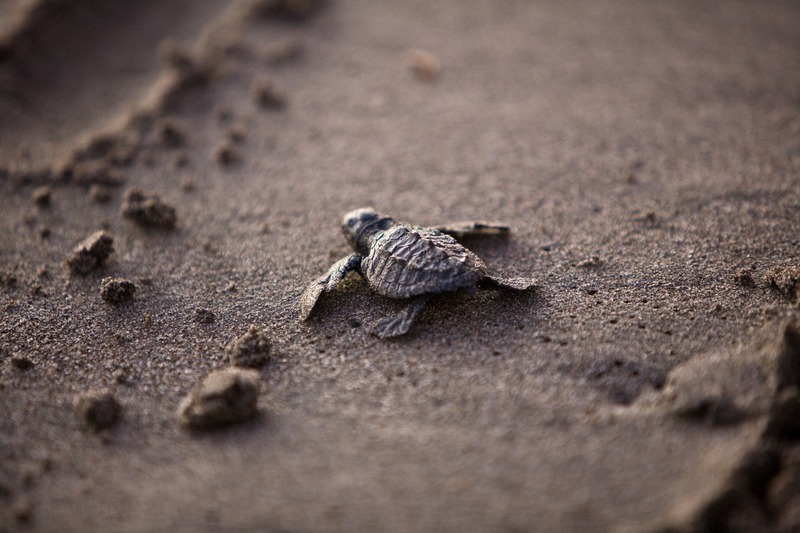 Baby turtles have the hardest time getting away from the nest to the sea, usually because of trash, toys left on the beach or holes dug in the sand. Even if it weren’t illegal to disturb or harm sea turtles and their nests, eggs and hatchlings, it would be wrong to ignore the very practical and relatively easy ways to be a friend to these creatures. Now, you know what to do! Thank you! Great timely and comprehensive info. Enjoyed this very much!